I know I joke about it a lot, but here it is again — Just Another Boring Bay Area Sunset, except this time it's a little different: instead of being under the hood training or trying to keep IFR proficient, I'm looking outside, and M., a local friend of mine, is sitting in the right seat taking photos and just generally taking it all in. And she's not even screaming "WE'RE ALL GOING TO DIE!!!" :-). Sometimes it's hard for me not to get a little jaded about the weather, the sights (Those Bridges! That City! The Hills! The Bay! The Pacific! 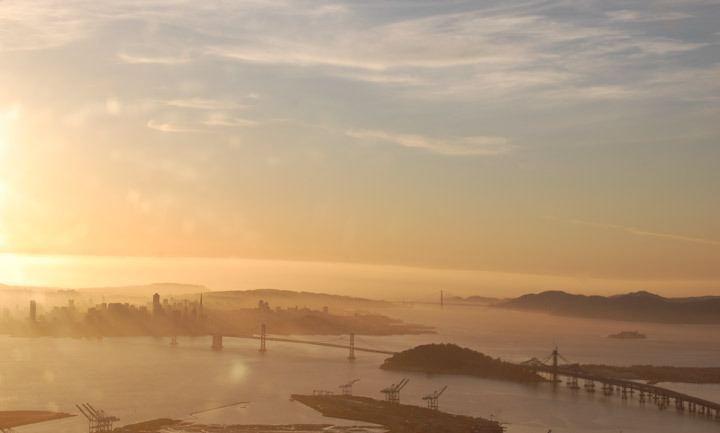 ), and the fun of just flying around doing nothing much at all… but it's M's first time over the Bay in a little Cessna like this, so I don't feel so blasé. I give her the controls as we head off past Alcatraz towards the Golden Gate. She gets to fly for a while — the first time ever, apparently. She gives me back the controls after a few miles so she can take pix and just look out. 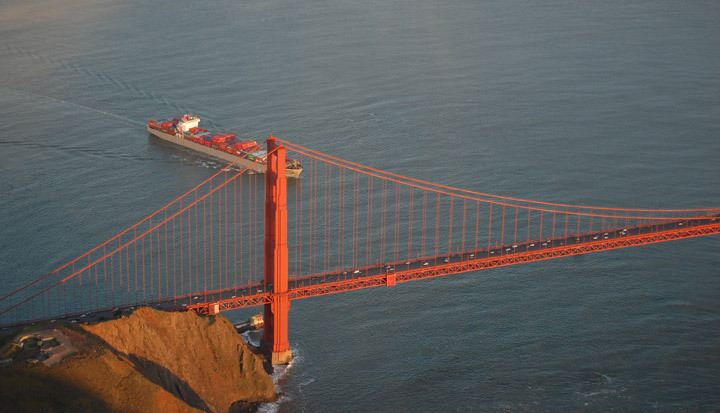 We circle the Golden Gate, watching the container ship head out towards China or wherever, then wander back slowly past San Quentin towards San Pablo Bay, where I do a bunch of steep turns and lazy eights because… well, because I can, and because M. enjoys it. 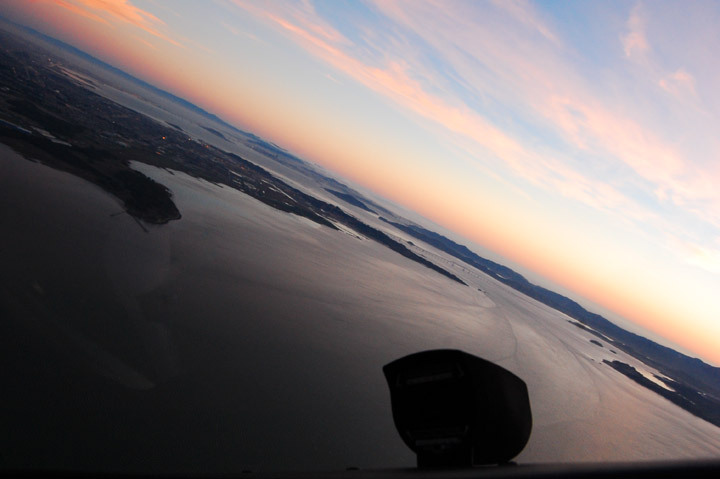 She flies some more, but mostly I get to fly while she looks out and watches the world go by in the twilight over the Diablo Valley and the East Bay hills. We get to do some creative work on final for Oakland (KOAK) in response to vectors from Tower for a Falcon jet coming in quickly behind us for runway 27R, a pleasant detour over and around bits of Oakland I guess most people don't see (or particularly want to see). Not sure why we didn't get the quick sidestep to 27L, but never mind. By the time we're back on track, it's dark, and the video game effect comes into play on final (airports at night are definitely one of my fave places). Luckily I can't see those seagulls lurking below me…. A really pleasant relaxing flight, despite the official forecast for at least moderate turbulence all day. Earlier, in the clubhouse, we'd run into John and the forecast was one of the things that came up (with a bunch of people chipping in…), but in the end we didn't get a bump the entire trip. Not bad, not bad. The pictures look great which tells more about the stories behind your write-up. She looks so happy on your flight and very excited to take pictures. Flying above the skies and seeing what's below is really amazing at all.Thanks for this blog, I enjoyed it!